Attention all engaged couples. This is the one you have been waiting for: Pencil Le Talbooth Wedding Open Day in your diaries for Sunday 2nd September. Where and when is Le Talbooth Wedding Open Day? Le Talbooth is set in the beautiful Essex Countryside on the Suffolk border, nestled by the river Stour.. The Marquee will be open to view in all it’s glory from 10.30am until 3pm on Sunday 2nd September 2018 set up the the amazing Milsoms Wedding Team who will be on hand to answer any of your questions. What Suppliers will be Attending Le Talbooth Wedding Open Day? 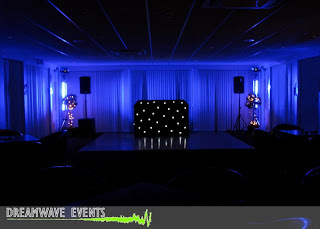 Of course, as the solely recommended company for DJ and Lighting Hire for the Milsom’s group, we will be attending and showcasing our lighting flare and DJ set up in Dreamwave style. 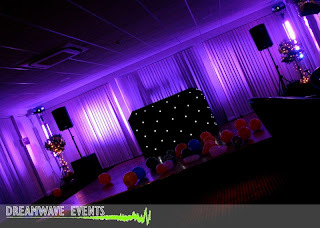 We have a multitude of choice of Lighting style, DJ services and Set up options to suit every wedding theme. Our Cocktail DJ Service for your Drinks Reception music is particularity popular on the lawn in the sun! Further expert suppliers present will be Anderson & Bergdahl Photography, Jades Flower Design, Luca Cakes, Red and Black Casinos and Soul Bay Strings who are there with lots of advice to plan your special day. So add this one to your wedding planning checklist as this will definitely help you tick a few boxes. You can thank me later! Step this way to love, laughter and happily ever after…. Wivenhoe House Wedding Fair is arriving on Sunday 17th September 2017. Arrive to a welcoming of refreshing bubbly and scrumptious canapés then have a leisurely morning talking all things weddingy with expert suppliers. This place will take your breath away. It is a romantically charming grade II listed country house in the picturesque setting of Wivenhoe Park. Katie, Sarah and the rest of the team will be at hand between 10am and 1pm to discuss wedding packages and advise on the best suppliers (including us!). Love is sweet, so take a treat. Come and chat to the Dreamwave team at Wivenhoe House Wedding Fair. When you walk into the room full of people make sure you make a detour to Dreamwave Events’ table. Chat about specially designed lighting and décor services as well as how our DJ’s will bring you smashing party that you will always remember. At Wivenhoe House Wedding Fair our Dremwave crew will help bring make your wedding vision a reality. We have a huge choice of lighting and décor options to suit all styles and themes, just ask us! From classic chic draping, Fairy Lights, Festoons, LOVE Letter lights to name a few – come and check us out for further info. Complete your wedding day with a cracking evening party. Boogie on down and bust some moves to tunes of your musical taste provided by our DJ’s mixing live on the night. So, follow your feet to Wivenhoe House Wedding Fayre cos September 17th is not far away. Believe you are on the right track to a fantastic wedding day! Spike is our beard rocking dynamic DJ, lighting designer and sound engineer. His energizing and enigmatic DJ performance will elevate your night guaranteeing an entertaining experience for your evening. He has also migrated into the office as my neighbour to help in the technical and warehouse department. I suppose you could label Spike as a chameleon who blends into each role with professional perfection! As my partner in crime in our exclusive corner of the office, myself and Spike enjoy cheeky banter and occasional throwing of some delicious snacks across to our office adversaries. Different people have different perceptions of the definition of cheese. For example, classic tracks can be equally ultimate floor fillers. You can play tracks that everybody will want to dance to that can accommodate a wide audience without being cheesy. Classics Whitney Houston and soul can really bring a crowd of guests together. It’s about playing the right tracks that everyone can relate too. Being a Dreamwave DJ, we pride ourselves on having the skills to read the dancefloor and play a great song selection; it’s about mixing the right tracks together to create class and not cheese! Music balance is so important. Some of the best parties I have had the pleasure of smashing have had a great balance of new and old tracks. Certain songs will only work at certain points in the evening. You need to take your guests on a journey and give them a great mix of relatable tracks that spur exciting and energy. Looking for an experienced family DJ for your wedding, birthday or personal party in Essex or Suffolk – Martin is the guy you want! What services are you prepping for? I’m loading up my DJ gear ready to provide evening DJ entertainment. I’m leaving soon to arrive in time to set up whilst they are eating their wedding breakfast. A quick change and then I’ll start. What’s the playlist like you have for tonight? After their first dance they have asked to go straight into the party, but initially want some familiar family tunes for their children to enjoy before their eye lids become too heavy. Later I plan to play music through the decades as requested by the couple. They have said they are happy for me to use my experience to read the crowd. They just want the dancefloor full! The bride and groom has sent us some awesome tracks to work from. I’ve got a bit of everything from Stevie Wonder and Motown to some 90’s pop like Backstreet Boys. So, what is the first dance? I have been asked to play “All of Me” by John Legend, a popular choice right now. Then I think I will move onto the new Bruno Mars track as it’s just so catchy and fun. And the song to finish the evening? They’ve chosen their last dance to be “Don’t Stop Me Now” by Queen, a real party classic. Martin has been with us since Dreamwave started sprouting roots in 2009 and his good judgement of music choice from reading the crowd only comes from experience making him the accomplished DJ he is today. His musical prowess and knowledge gained from DJing since he was teenager will make sure you never stop dancing! We are thrilled to call him a member of our team. If you want to find out more about our DJ Services or speak to us about your upcoming party, please contact us and we will be more than happy to help. We look forward to meeting many potential clients on the day. Private Party: The Angel Inn, Ipswich. On Saturday 4th April we provided our DJ & disco services at The Angel Inn, Ipswich. The occasion was a surprise 30th birthday. This relatively small setup complemented the small venue perfectly leaving loads of room for the guests to dance the night away! They were even dancing on the tables at the end of the night!. The party was a roaring success and all the guests had a great time. 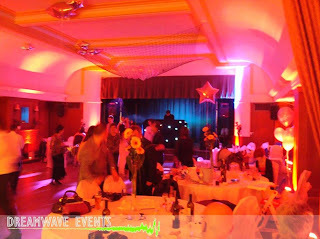 Dreamwave Events has recently evolved from the combination of two separate companies. Dave Drane of Dreamer Events and Paul Pollard of Making Waves Professional DJ & Disco Services became a partnership on April 17th 2009. Both Dave and Paul are very excited about being able to combine their professional and reliable services, along with their experiences in the entertainment industry together to create Dreamwave Events. New exciting news coming soon! Thank you to all the people that visited our stand, we hope you found our information helpful. On Saturday 14th March we provided our complete wedding DJ & disco service at the Colchester Garrison Officers Club. Our clients, the new Mr & Mrs Evans also booked our optional up-lighters to enhance their wedding colours and ‘pink’ theme, they were both amazed at the effect the up-lighting gave. The bride and grooms first dance was also enhanced by the use of our low fog & bubble machines and the brides request for the ‘disco lighting’ to only be set to 3 colours (pink, purple & blue) was also fulfilled. All attending this special day said they enjoyed the DJ & disco entertainment. I would like to wish the new Mr & Mrs Evans all the best for the future as husband and wife. 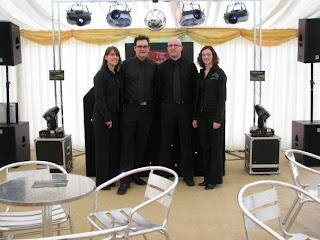 On Saturday 7th March we provided our DJ & disco services at Stoke By Nayland Golf Club. The event was a surprise 25th birthday for the party for the Sage family. 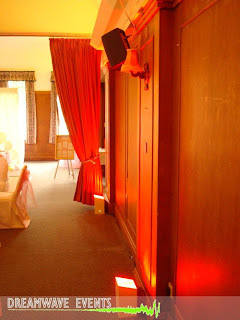 You will see for the pictures below that our contemporary and stylish mobile disco setup blended in perfectly with the look and feel of The Garden Room. The party was a great success and all guests had a fantastic time.